One small step for schools, one giant leap for education. AMSCO School Publications, Inc. and ECTACO, Inc. partner to finally bridge the gap between students and eTextbooks with the jetBook Color, the only color E Ink educational eBook system developed specifically for schools. For over 70 years AMSCO has contributed to educating millions of people with their textbooks. ECTACO, known as the preeminent handheld language source, has developed and distributed devices and linguistic software in over 200 languages since 1990. A natural union of both companies occurred when ECTACO developed a dedicated eBook reader - ECTACO jetBook Color – which carries the highly regarded concept of “healthy reading”. The jetBook Color was conceived by ECTACO to provide schools with benefits that cut costs and increase student productivity. 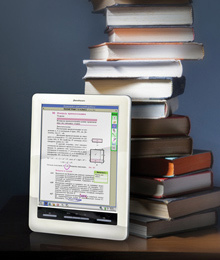 Alongside being the only touchscreen color E Ink eReader in the world, it’s preloaded with many academic tools and resources such as the Oxford talking dictionaries and SAT prep courses; Math, Physics, Chemistry, Geography, and Biology references; graphing, accounting, and scientific calculators; multilingual talking translators; fluent Text To Speech for all books – a useful feature for students with dyslexia and more. Most significantly, it enables schools to add their own content in a multitude of formats at no additional cost. This means that every eTextbook purchased can instantly be loaded to the jetBook Color, along with any notes, homework, and other reading materials as well. The revolutionary color ePaper display delivers a high-contrast, sunlight readable, low-power performance that further closes the digital divide between paper and electronic displays. This is the only eye friendly type of display developed exclusively for the education community.